How to Do System Restore, System Reinstallation? This article introduces the reason why need to restore system, and what should be done before system restore, as well as how to restore operating system with a powerful and free tool-AOMEI Backupper. Blue Screen or the OS cannot boot. Damages caused by natural disaster, earthquake, debris flow, etc. In situation due to any reason mentioned above, you have to do a system restore. 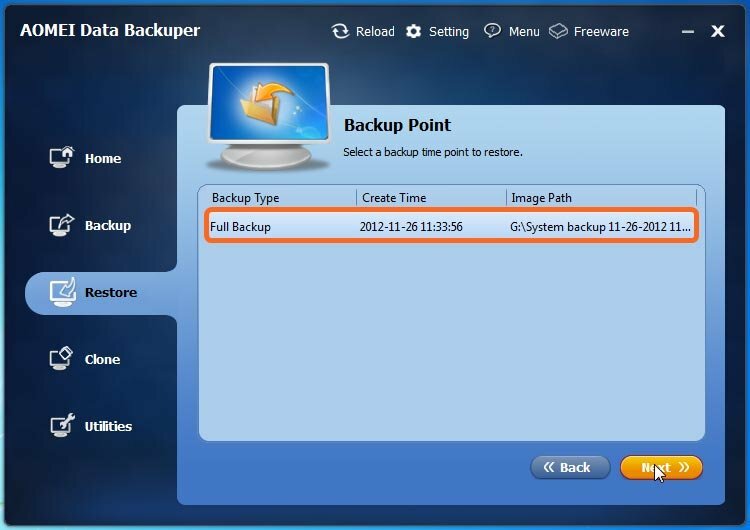 Of course, the precondition of system restore is that you have made a corresponding backup in advance. 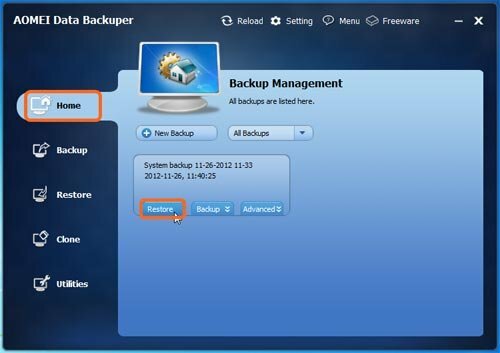 If you have not created a system backup, or do not know how to create one, you can refer to the tutorial - How to backup operating system. Although the system has some problems, it still may store some important new added data, which might be stored in "Desktop", "Favorites", "My Documents" and so on. 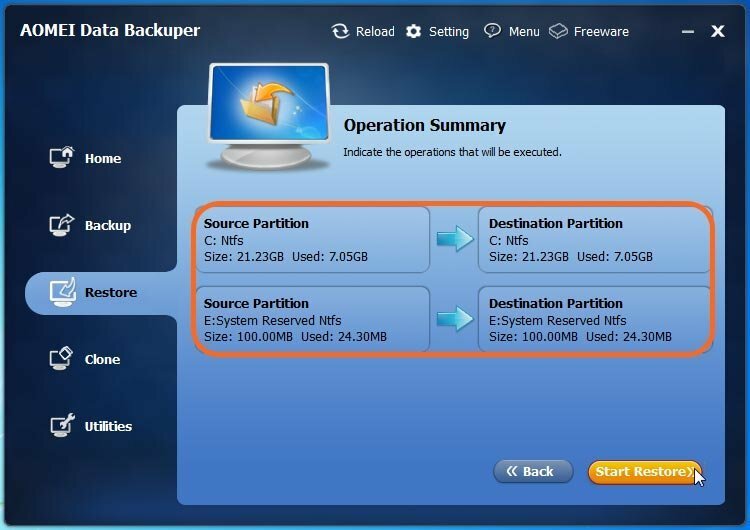 Under these circumstances, you should copy these data to other partitions to avoid data overwritten after system restore. To ensure better security, you can make a full backup for the current system if you have enough disk space. Thus, even if there is any data that you forget to copy it out and has been overwritten, you can get it back again from the image file backed up before. For driver installation after system restore, you may use driver updater software Driver Talent which will download and install drivers with one click. System restore is just like a piece of cake for AOMEI Backupper-a backup and restore software. If the current system can run normally, we can carry out the operations by directly launch this software in Windows. But during the operation of system restore, this software will remind you of completing the operations under the Restart Mode. At this time, it is necessary to restart computer, and then just follow the software prompts to realize system restore. If the operating system cannot boot, You can boot your computer using AOMEI bootable media created with AOMEI Backupper or using AOMEI PXE feature from another working computer within the same network. For detailed tutorial, you can refer to the article, "System restore via bootable CD". Here come the steps of Windows system restore with AOMEI Backupper. Tips: download this free software, install and launch it. Step 1: select a backup task, there are two methods. Method 1: you can click the "Restore" option of a corresponding backup under the "Home" tab. After system restore, we could access the normal system again. But after the system backup, there may be some new applications which have been installed on the current system. 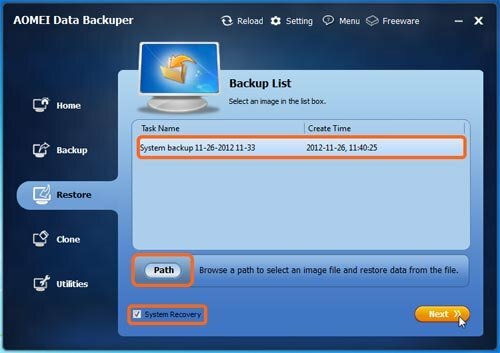 In this case, these new applications installed after system backup cannot be recovered by system restore. If you need these applications, you have to reinstall them in the operating system again. Therefore, you had better do system backup at intervals. Thus, the system can be restored to the latest state to avoid reinstallation of plenty of applications after system restore.